On the Success Track in business, there is no push button to success. When times get tough, many people let their fear of failure out-win their desire to succeed. Kirsten Lowis has written The Success Track for the love of small business. Kirsten started business flying solo and with steely determination, she has bought and sold a franchise, retail shop and built two very successful consulting companies. She has also sold, valued and consulted to hundreds of businesses and worked with the best facilitators across the globe who are successful in their own business. Often, on the road to small business success, Kirsten has seen first hand the struggles of small business owners. Often they don't know where to turn for help or they don't have the money for help, so they pull off the 'business highway', especially when they get some hits or rejection, illness or if they lose something like money. Then they just park. Not because they are broken down, but more that they don't want anybody to look notice them. They just get off the highway, and parkindefinitely. They go nowhere. They lose strength and power. When you learn and apply the principles of The Success Track, you will drive yourself and your business to reach a level of success that you haven't even contemplated. It's all here, and it's all yours for the taking. Don't worry about the odds. 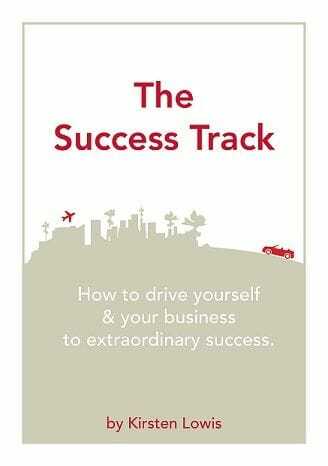 If you want to get back on the highway, order your copy of The Success Track today!